Companies keep trying to make tablets for education happen. Two weeks ago, Acer announced the $329 Chromebook Tab 10, a confusingly named slate running Chrome OS that was designed with students and teachers in mind. Then Apple followed that up with a revamped iPad featuring some new education apps and Apple Pencil support. But to me, neither of these devices truly hit the spot, because they still lack the one feature you need for real productivity: a keyboard. Sure, the new iPad has a clunky looking keyboard from Logitech that you can tack on later, but it doesn’t have support for Apple’s own Smart Keyboard made for the iPad Pro. It’s also possible to hook up a Bluetooth keyboard to the Chromebook Tab, but those don’t feel like fully thought out solutions. So to help address those shortcomings, HP went out and made the Chromebook x2, the world’s first detachable Chromebook whose keyboard actually comes in the box. In essence, that makes the Chromebook X2 HP’s take on a low-cost Surface Pro with Chrome OS instead of Windows. However, there are a few differences. Instead of using a kickstand to prop the Chromebook x2 up, for example, the system features a detachable magnetic hinge that functions more like a traditional laptop. 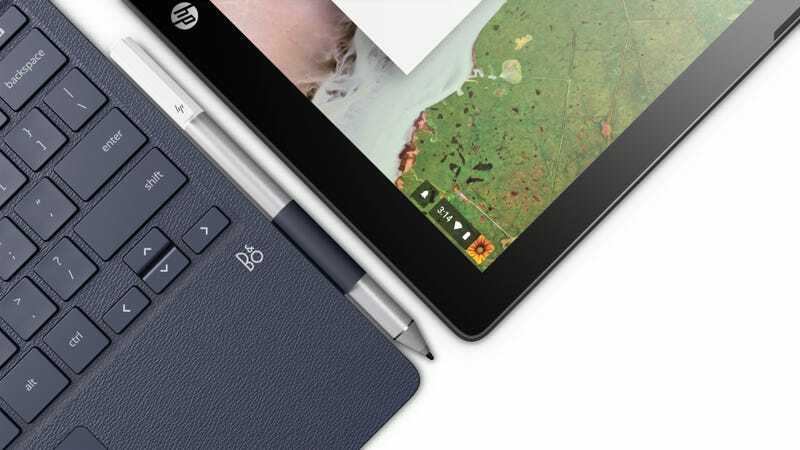 Like the Surface, the Chromebook x2's guts are all contained in the tablet section of the device, with the screen featuring full stylus support using HP’s Active Pen, which like the keyboard, also comes included. The Chromebook x2 should be slightly more powerful than your average Chrome OS laptop, thanks to its 2400 x 1600 12.3-inch touchscreen, Intel Core m3-7y30 CPU, and 4GB of RAM. You also get stereo speakers tuned by Bang and Olufsen, two USB 3.0 Type-C ports, and a headset jack. On the flip side, the Chromebook x2 also costs more than a typical Chromebook with a starting price of $600. For that kind of money, I wish HP offered more than a paltry 32GB of eMMC storage, even if it’s possible to tack on more room later via the x2's on-board microSD card slot. For those of you saying this thing is actually meant to go up against the 12.9-inch iPad Pro, that’s not an entirely unworthy comparison. However, like the Surface, the iPad Pro doesn’t come with a keyboard or stylus as standard, they are optional extras. That adds $270 to the price of the cheapest $800 iPad Pro, which is all told is $50 more than an equivalent Surface Pro package (tablet plus Surface Pen and Type Cover). And that’s before you run into issues that can crop up when trying to use iOS as a full-time work device. So if you’re looking for a more premium Chromebook, and you don’t want to shell out $1,000 for Google’s Pixelbook, the Chromebook x2 seems like a potentially interesting middle-ground. But we won’t know for sure until it comes out later this summer on June 10th.